We’d like to share a recent exciting success story, a new SVOD service launch, powered by Cleeng. 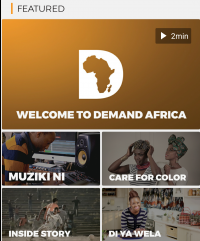 Demand Africa, a subsidiary of The Africa Channel recently released a new SVOD service targeted to the African diaspora in the U.S. and around the world. We are proud that this ambitious over-the-top service has been built via Cleeng’s subscriber management technology. 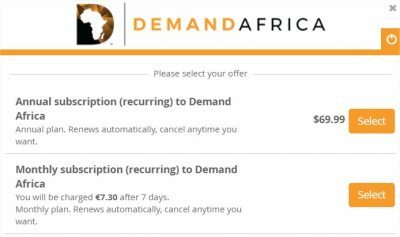 Demand Africa focuses on Africa-originated television series, specials, documentaries, movies, music, biographies and cultural and historical content. To strengthen its presence in the U.S, Demand Africa aims to reach 25-54 aged viewers who want to consume Africa-centric and diasporic video content on their favorite media devices. Cleeng remains strongly focused on helping brands succeed in the OTT space quickly and sell content directly to consumers. This solution provides a unique 360-degree view of the full customer journey, from subscriber identity, payment and churn management, to end-user support. “We needed an intuitive turnkey payment and subscriber management system that could service our subscribers on a global scale. Cleeng’s solution was uniquely positioned to accomplish this.”, adds Dean Cates, a Director of Digital and Marketing Strategy at The Africa Channel. The new service has two main subscription packages, a monthly offer priced at US$6.99, and a discounted annual offer of US$69.99. In-app payments (IAP) and multi-currency pricing (MCP) is fully supported. The broadcaster also uses the Cleeng’s coupons system to create incentives programs and trigger early-bird demand. Demand Africa joins a growing list of media brands launching services on OTT Flow, a turnkey solution from Brightcove (streaming), Accedo (apps) and Cleeng (subscription management). OTT Flow enables media organizations like Demand Africa to deliver television-like experience across various devices and platforms, with no up-front development costs. The service has been launched last in October and is available worldwide, with a special focus on the U.S., Canada and the Caribbean region. The offering is now available on the web, on iOS and Android devices and via Roku, Apple TV, Android TV and Amazon Fire TV.